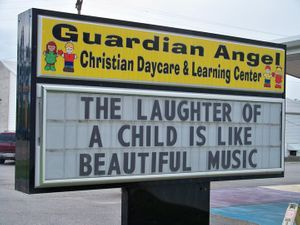 At Guardian Angel Chrisitan Daycare & Learning Center we provide quality care when you're not there. We specialize in providing exceptional child care at a reasonable rate. All of our teachers are adequately trained to handle the needs of your child. If you are looking for a quality care for your child(ren) then call us today! We gladly give tours of our center and look forward to serving you and your family. Contact us today! Our Mission Statement: To provide a place of teaching children their Chrisitan heritage through means of Christian childcare as to raise up a generation to come of God fearing adults.